Yesterday was the final day of the London 2012 Paralympics and so I’ve now finished operating using my special callsign of GO6NHU, in fact I finished operating a few days ago. I’d set myself a goal of making over 2000 QSOs with the special callsign and once I hit that goal I decided to stop at what seemed like an appropriate number – 2012 QSOs to celebrate the London 2012 Games. I operated only using data modes and these were, JT65, PSK31, PSK63, PSK125 and RTTY. I only worked a handful of stations using JT65 and PSK125 – JT65 is just too slow and PSK125 is not very friendly when signals are weak. Here’s a breakdown of the modes used. RTTY was by far the most popular – I actually preferred to use PSK63 because of the extra speed over RTTY but I operated where I could get most QSOs and activity with the callsign and RTTY was the way to go. I also had a go in a couple of data contests using RTTY and that pushed the totals up. I operated on 40m, 20m, 17m, 15m and 10m but 20m was by far the busiest – I guess that’s not too surprising really. I worked a total of 82 DXCC entities which I’m happy with, I’d hoped to reach 100 but it wasn’t to be. 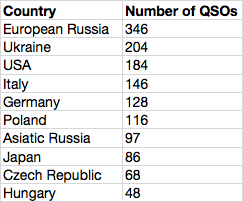 I didn’t go searching for countries to work, every single one of the 2012 QSOs was stations calling me in reply to my CQ calls. I didn’t tune around looking for anyone, I simply found a frequency and called CQ and people replied, it was a nice experience to be operating with a callsign that people wanted to work. I ran my logbook through the qrz.com database and pulled out the details of those who have their location stored – Out of the 2012 QSOs that gives me just under 1700 spots on a map and here it is. Click the map for a full size version. Did you work me as GO6NHU? You can check if you’re in the log using the ClubLog widget here and you can also use that widget to request a QSL card to be sent either direct or via the bureau. The cards haven’t been designed yet but that’s a priority job for the next few weeks. My entire GO6NHU log has been uploaded to LoTW, ClubLog and eQSL.cc.